It's interesting how the folk who handle Doctor Who's expanded marketing have opted to write books based on titles shown or mentioned on the show. It's one thing to directly adapt the events of an episode into a novel. It's an entirely different thing to consider creating a story based on a book cover that was featured in an episode. Summer Falls is another such novel, similar to the previously released The Angel's Kiss, which was a Melody Malone mystery. I wasn't quite sure what t expect from this book since it doesn't actually feature characters we know directly from the show, given Melody Malone was actually River Song. Instead we just have a story that only exists because the book appeared in the show. That's really not much to go on. But to be fair, it was a fairly interesting little adventure that naturally has echoes of the show, even though the Doctor does not "officially" appear in the story. And that's well and good enough - it allows the book to try and get along through its own merits for the most part. Synopsis: Doctor Who: Summer Falls is an ebook released in connection with the Doctor Who episode, The Bells of Saint John. 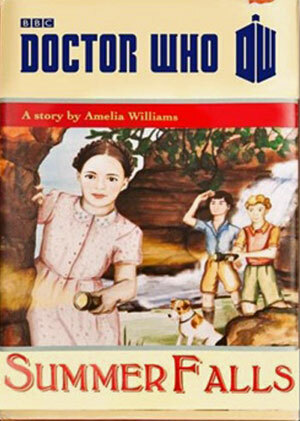 The author is listed as Amelia Williams, better known in the show as Amy Pond. It was actually written by James Goss. The story is set in the small seaside town of Watchcombe where a young Kate is enjoying the last few days of her summer vacation. She and her mother had only just recently moved into town, thus Kate doesn't have any significant friends and often explores the town on her own. She does eventually befriend Armand, the son of the pharmacist who seems to have a reputation for mixing up orders. She also meets the mysterious curator of the museum that she eventually comes to know to be Barnabas. Things start to become strange once Kate stumbles upon a paining called "The Lord of Winter." The painting almost seems to be too real to be just a painting with the oceans almost appearing to be wet. But as she looks into the story behind the painting, he discovers a bit of a mystery that has been pretty much just been out in the open. But the few other children in town are starting to behave rather strangely and it seems that there may very well be a Lord of Winter who is making his way to Watchcombe soon enough. The book's tone is interesting given some of the statements follow more modern vernacular, however the setting and such remains firmly rooted in the past. And this is naturally deliberate since it's depicting how the book was written by Amy Pond after they had been sent back in time "The Angels Take Manhattan" and thus she remains a woman out of time together with Rory. And while "Amelia" does not address the reader directly, her voice does ring true above everything else. The character Barnabas is obviously inspired by the Doctor given his peculiar nature and the fact that he seems to have a shed that could very well by the TARDIS. Quirkily enough, he explains that he's in-between names when Kate tries to ask who he is. They eventually settle on the name Barnabas as a way to address him and together with his talking cat, he seems to have a better understanding of everything that's going on. For a short book with no direct Doctor Who characters in it, it's actually quite well-paced and features good Companion-level action as Kate tried to find a way to stop the Lord of Winter. And she doesn't quite have the benefit of the Doctor working directly against the Lord of Winter as well, it's rather impressive how much she manages to accomplish. Then again, Kate seems to have a lot of Amy in her, and so it's only natural that she share the same cleverness and courage in the face of adversity. In fan circles it's said that the book actually plays out like a guide to how one might defeat the Great Intelligence. Admittedly the whole Lord of Winter moniker does seem to fit that particular Doctor Who villain. And when you look back at how he was defeated...I'll leave the rest for you to figure out. All in all, it's an interesting angle to things that I appreciate in terms of the book. Summer Falls is a surprisingly entertaining read for what could have been a fringe tie-in novel for the Doctor Who series. It just goes to show that the Doctor is more than just a character - perhaps a little of him lives on in every person he meets. Thus the book gets 4 unusual conversations with the cat out of a possible 5.